We took advantage of early voting last week. On Friday we each cast our vote for life and liberty. Here we are leaving the polling place. During our travels to and from Reno we had the opportunity to talk to many people from different walks of life, not all Catholic, who all said they have deep sense of peace about the elections and a strong hope. We came home from that trip very encouraged. God is in control. No matter what happens, we must keep that foremost in our minds and hearts. As one friend of ours often says, God is very good at turning straw into gold. Today we are manning (nunning?) adoration of the Most Blessed Sacrament at Our Lady of the Atonement. We have cast our votes, now the most important thing that we can do is pray. And having the Blessed Sacrament exposed in a public chapel, rather than our home chapel, was very important to us, and to Fr. Phillips as well, so that others could have an opportunity to make a visit to Our Lord. Wherever you are today, even if you can only spare five minutes, try to make a visit to Our Lord and ask Him to pour out His grace and mercy on our nation. Adoration may not be available where you live, but Jesus is just as glad to see you, whether He is hidden in the tabernacle or exposed in the monstrance for adoration. 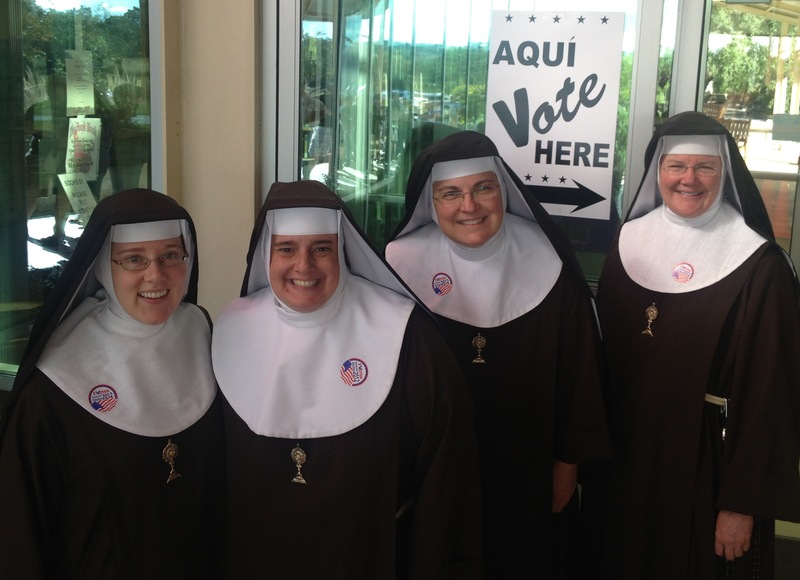 This entry was posted in 33 Days of Prayer, A Nun's Life, Elections and tagged adoration, election, life, prayer, religious freedom, trust, vote by texasnuns. Bookmark the permalink.